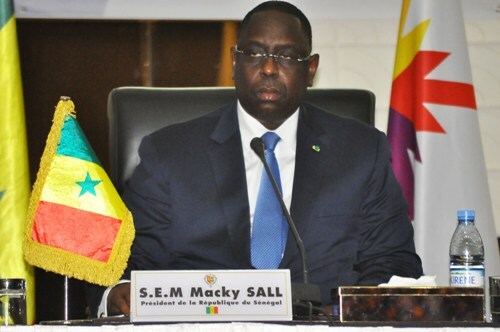 Seydou Gueye, the national spokesman of Senegal’s ruling Alliance for the Republic (APR) has said President Macky Sall is set to be unveiled as the coalition’s standard bearer next month, ahead of presidential elections early next year. President Sall who is seeking a second term, will be officially unveiled by his coalition “Benno Bokk Yakaar” (United in Hope) on 1st December, 2018. “The prospects opened by the rule of President Macky Sall augur a bright horizon of possibilities for the Senegalese people, and consolidate hope and confidence” Seydou Gueye announced in Dakar on Thursday. Gueye, who doubles as a minister and spokesman for the government, was speaking at press conference at the APR headquarters. The date chosen for launching Sall’s candidacy will coincide with the tenth anniversary since the creation of APR in 2008. Reacting to the heated debate over the discovery and exploitation of oil and gas in Senegal, Gueye claimed President Macky Sall’s right to ask those who do not know about this to be humble enough and seek clarification to avoid passing inaccurate judgment on the issue. According to him, the stance of a segment of the opposition unmasks its strategy of “a systematic campaign of intoxication, misinformation and slander." He concluded that this is a way for opponents of the ruling majority "to herald in advance their resounding defeat on 24 February, 2019 when Senegalese go to the poll to elect a new president. “The decision by Macky Sall to out all mining, oil and gas contracts is a major democratic stride that broadens the scope of transparency” Gueye said. Mr. Gueye said Sall's political program is one of quality and the nature of his presidency since 2012 works in his favor. As an illustration, he revealed figures which, according to him, show that Senegal has made giant leaps forward. “Gross Domestic Product (GDP) per capita increased from CFAF330 644 in 2000 to CFAF411 797 in 2016, Foreign Direct Investment (FDI) soared from 1.7% of GDP in 2012 to 2.7% of GDP in 2016 while wage employment went up from 22.1% in 2000 to 31.9% in 2017,” he concluded.